Sold as an assorted set of (6) green and purple peacock design ball ornaments- (3) purple and (3) green peacock. Made of quality glass material with glitter accents and intricate detailing; each features matte finish and glittered peackock design with gemstone accents. 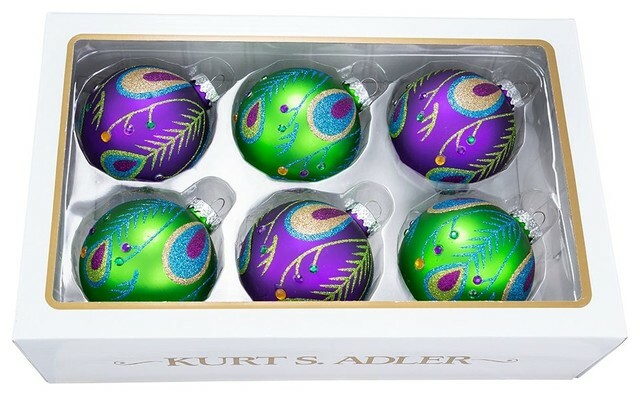 Ornaments measure approximately 80mm/3.1 inches in diameter. Perfect for displaying on a Christmas tree or ornament stand as a festive holiday accent piece. Carefully packaged in a fitted box for easy gifting and storage.